Theater is deeply embedded in our culture, and in the historic state of Maine, you’ll find some iconic venues that have stood the test of time. From playhouses in barns to opera houses dating back to the early 1900s, prepare to be blown away by these incredible theaters in Maine. The Hackmatack Playhouse is a summer theater that was created in a barn on a farmstead dating back to the 1600s. The barn burned down back in 1934, but was subsequently rebuilt and used for farming for many years. The theater made it its home in the early 1970s, and it stands tall today as a true fixture of Berwick. Built in 1912, the Stonington Opera House is home to the local group known as Opera House Arts. Summer productions are big draws for locals and those visiting the region. You’ll be taken back by the history of this opera house. friday night in stonington, maine. First opening as a movie house, the State Theatre was completed in 1929. The Spanish design is elegant and was fully restored for the 2010 reopening. These days guests see movie premieres, attend seminars or attend special celebrations here. Some more photos by @laurynsophia of last night's sold out #beatlesnight2017. The last performance this year is today's Family Matinee at 4pm. Doors open at 3pm, tickets available at the State Theatre box office starting at 2pm. The Star Theatre in Kittery, Maine, is home to top-notch musicals, concerts, dance performances and lectures. Housed in the old Frisbee School, the building was erected in 1943. The original brick lends itself to the very special ambience theatre-goers enjoy when there. The Ogunquit Playhouse is a summer tradition for many Maine visitors. Opening in 1933, the summer productions nearly all feature Broadway or nationally-renown talent in one of the leading roles. Opening its doors in 1923, the Strand Theatre is now listed on the National Register of Historic Places. Today locals and guests enjoy indie films and live theater and music performances. Known as the home of Maine’s only Shakespearean troupe, the Theater at Monmouth was built in 1900, and for decades was known as Cumston Hall. The original stained glass windows are a sight to behold. The theater was founded in 1970, and entertains people from all over Maine—and beyond. Built in 1938, the Art Deco design in the Grand is as alluring as the entertainment. From movies to live entertainment, this theater has been home to culture and the arts for decades. 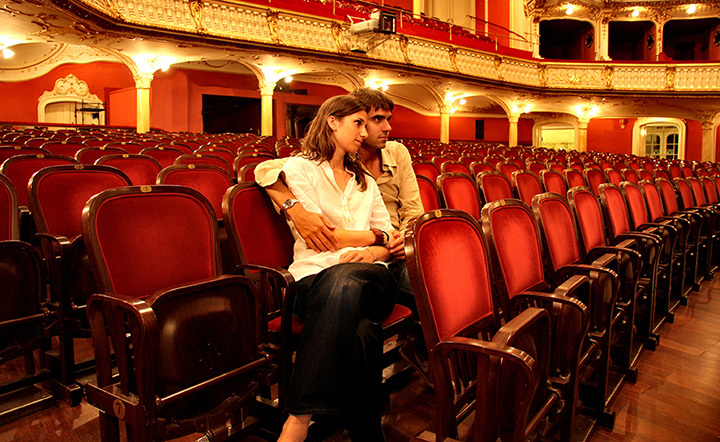 Built in 1932, the Criterion Theatre shows movies, live theatre, concerts and more. Open year-round, it’s as popular with tourists in the summer months as it is with locals. View more Maine Theaters and Playhouses.